1. Why are potatoes important to New Brunswick? Agriculture is one of New Brunswick’s primary industries. With rich soils and a cool climate, farming has become an important part of our provincial economy. Potatoes are the largest cash crop grown on New Brunswick farms. 2. How long of potatoes been grown in New Brunswick? Potatoes were first cultivated in New Brunswick in the middle of the 17th century. Today, producers grow more than 50 varieties of potatoes on over 26,600 hectares (58, 500 acres) of land. The most popular varieties include Russet Burbank, Shepody, Kennebec, Superior and Chieftain. 3. Are all potatoes the same? Certainly not! New Brunswick potatoes are known for their delicious flavour and are available in an assortment of colours, shapes, and varieties. There are also taste differences, thereby ensuring you an excellent choice for different purposes. Although they all share certain properties, each variety has been specially developed to meet different cooking requirements. 4. When I buy “new potatoes”, what am I getting? “New” is not a variety, but a stage of growth. Size, colour, and shape do not signify “newness”. A new potato is one that has just been harvested. Once it has been stored it is no longer new. In fact, Canadian grown potatoes may not be marketed as new after September 30th. 5. Are potatoes good for me? New Brunswick potatoes are a great choice in your diet. A medium potato contains only 100 calories. That isn’t much more than a medium sized apple. 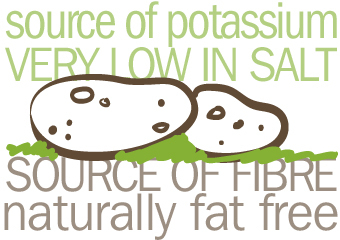 Potatoes are the perfect low calorie carbohydrate. They’re a good source of dietary fibre, Vitamin C, Vitamin B6, iron, and potassium. Potatoes contain no cholesterol, and almost no sodium. 6. Sometimes, my potatoes disintegrate after you boil them? How can I prevent this? If your potatoes are disintegrating when boiled, cook them 5 minutes less than you normally would and drain them quickly. If potatoes are produced during a very dry growing season, they will tend to have a higher than normal solid content and less moisture. When these are cooked, they absorb more water than usual and, as a result, fall apart at the end of cooking. 7. My potatoes darken during cooking. What am I doing wrong? Your potatoes probably suffer from being stored at too cold a temperature. Store potatoes in a dark, dry, well-ventilated area where the temperature is between 7 and 10°C. They can be kept for a few months. If this is not possible to do in your home, only buy enough potatoes for one or two weeks. 8. How do I get my baked potatoes to fluff when cooked? Long-shaped potatoes will be fluffy when baked just until tender. The most popular variety for baking in New Brunswick is the Russet Burbank. Potatoes baked in the microwave are not as fluffy as oven-baked potatoes. 9. How many potatoes make a cup? 10. How do I pick the right potato? Choose potatoes that are firm and free of blemishes. Selecting the right potato for your needs is easy if you understand the relationship between a potato’s appearance and its intended use. Long-shaped potatoes are most suitable for baking, microwaving or frying. These potatoes will fluff up when baked. To boil, cook slowly over medium heat using only a small quantity of water. If they are cooked at a full boil in too much water, long-shaped potatoes may not hold their shape. Round-shaped potatoes are generally better when boiled. They keep their shape and their texture stays firm. They are excellent in salads. Potatoes are fast and easy to prepare at a guaranteed profit. 11. What’s the best use for long-shaped potatoes? Long shaped potatoes are most suitable for baking, microwaving, or french frying. These potatoes will fluff up when baked. To boil, cook slowly over medium heat using only a small quantity of water. If they are cooked at a full boil in too much water, long-shaped potatoes may not hold their shape. 12. What’s the best use for round-shaped potatoes? Round shaped potatoes are generally better when boiled. They keep their shape and their texture stays firm. They are excellent in salads, soups, stews, and similar dishes. 13. What causes a potato to turn green? What happens if I eat green potatoes? “Greening” is a color change in the potato when it is exposed to light. Avoid eating the green colour because it is bitter and may cause stomach upsets if eaten in large quantities. Remove all green portions on potatoes before eating. Better still, do not eat green potatoes at all. Potatoes displayed in plastic bags by supermarkets can turn green. 14. How do I prevent potatoes from turning green? To prevent greening at retail, poly bags should be displayed label side up. The printed or opaque side of the plastic bags act as a light shield. The window on a paper bag should be face down. To prevent greening at home, store your potatoes in a cool, dark place. Potatoes packed in a plastic bag should be transferred to a paper bag to protect them from light. 15. I like the way potatoes look in the stores in plastic bags. However, someone told me that this is not good for them. Is this true? New Brunswick potatoes packed in a plastic bag should be transferred to a thick paper bag to protect from light and enable them to breathe. Exposure to light will cause potatoes to turn green and acquire a bitter taste. That is why you also see many potatoes marketed in thick paper bags. To allow you to see what’s inside, New Brunswick potato shippers usually use bags with a net opening on one side. 16. What causes a potato to have a hole inside? “Hollow heart” is a discoloured hole sometimes found in the center of an otherwise healthy potato. It can be caused by rapid growth, extremes in watering, or drought in the farm field. A hollow heart potato can be eaten, but to improve its appearance the hollow piece should be cut out. 17. Are potatoes as sensitive as apples and other fruits and vegetables to rough handling? Potatoes will bruise, thereby diminishing the quality, if they are not handled carefully. Even though you may not see damage such as you would if you dropped an egg, bruising will still occur. Be gentle when handling your New Brunswick potatoes. Don’t drop or throw bags. Handle them like eggs! 18. How long can I store potatoes? New Brunswick potatoes stored in a cool (7˚C to 10˚C or 45˚F to 50˚F), dark place will keep several weeks. At room temperature, they will keep for approximately two weeks. 19. What happens if potatoes are stored at a high temperature? If you are using the potatoes shortly after you purchase them, they should be fine. High temperatures cause potatoes to sprout, shrivel, and lose nutrients. 20. What happens if potatoes are stored at too cool a temperature? Storing in too cool a temperature (refrigeration) will make the flesh darken when cooked and give potatoes an unpleasant sweet flavour. Refrigerator storage is only appropriate for new potatoes. Storage below 4°C causes chilling injury, which results in dark grey to reddish brown blotches that are intensified by cooking, depending on the variety.